An exotic retreat nestled in the North Malé Atoll, Makunudu Island delivers just what you'd expect from a lifetime trip to the stunning paradise islands of the Maldives. Luxury holidays are enjoyed in this pocket of bliss where island living is both soothing and decadent. The finer things in life merge with simple nature to create an unhurried special haven that touches the heart of every visitor. Make your way into a private beachfront villa on this North Malé abode, gaze out to the crystal clear waters of the lagoon and beyond, walk barefoot in the sand before returning to your private sun loungers and the shade of palms. There is adventure and relaxation on this private island, from snorkelling among rich coral reefs to sunset cruises and champagne lunches. The Aavun Spa will complete this lavish experience. Pure white sands and crystal-clear waters surround the Makunudu Island resort. 50 minutes speedboat transfer from Malé International Airport. How far is the nearest resort? Makunudu Island boasts its own restaurant and bar. Guests can also enjoy a number of excursions from the resort. 36 beachfront bungalows are perfectly designed to allow a superb level of luxury and relaxation. 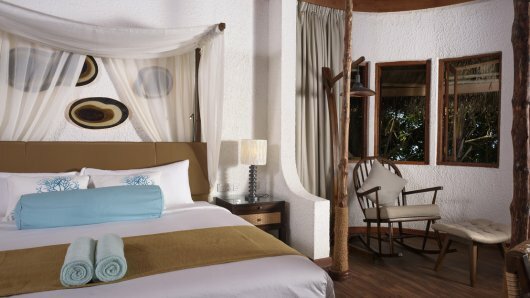 In shade and full air-conditioning, guests can sink into plush king bedrooms furnished with natural woods and airy colour tones. A rustic style of luxury is evident throughout. An open-air shower leads off from the main bathroom whilst still retaining complete privacy, Just steps from the beach these beautiful villas are pure indulgence. Classic and new combines to create flavourful dishes here at this exotic venue. It's a melting pot of east and west, with sumptuous buffets and sizzling barbecues vying for your attention. Table menus and special occasion-candlelit beach dinners are further additions to both service and style. Once a week guests can enjoy a Maldivian buffet dinner along with other regular theme-night delights. Sand Bar will enhance the experience by offering an eclectic mix of tropical cocktails, juices and all manner of beverages. Perfect for sundowners or at any time, it's the hub of the social life at Makunudu Island. If you choose to go all inclusive, the programme generally consists of breakfast (8am to 10.30am), lunch (1pm to 3pm) and dinner (7pm to 9.30pm), all buffet style. During meals soft drinks, beer, water and wine are usually offered. Locally produced alcoholic and non-alcoholic drinks like water, wine, refreshments, soft drinks, beer and spirits are usually served from 11am to 10pm (except during meal times).